The southern black racer is a subspecies of the Coluber constrictor that can be found throughout much of the southeastern United States. The snake is not venomous, is mostly black except for a white section on its chin, inhabits grassy and wooded areas like thick brush and thickets of plants, and subsists mainly on small lizards and rodents. Let’s take a closer look at the southern black racer snake and see how it is different/similar to other snakes in its home region. 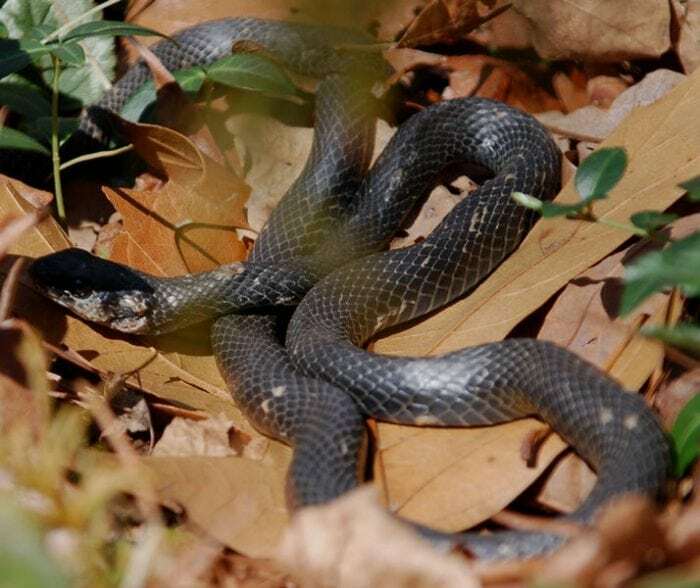 As mentioned, the southern black racer is a subspecies of Coluber constrictor snakes. Coluber belongs to the family Colubridae, which is the largest known snake family. Other members of the genus Coluber include the buttermilk racer (Coluber constrictor anthicus), the tan racer (Coluber constrictor etheridgei), the blue racer (Coluber constrictor foxii), and the everglades racer (Coluber constrictor paludicola). The southern black racer, as the name implies, is almost entirely black except for a whitish gray chin and sections of the underbelly. This coloring scheme isn’t unique to the black racer, as the rat snake, garter snakes, and the indigo snake also share a similar color scheme. The cottonmouth snake also looks similar to the black racer, which unfortunately makes some people kill the black racer believing it to be venomous like the cottonmouth. Yet the black racer is not venomous and kills its prey by constricting them. The distinctive color pattern of the black racer is what they look like as an adult. Juvenile black racers actually have gray or reddish-brown splotches on their skin. 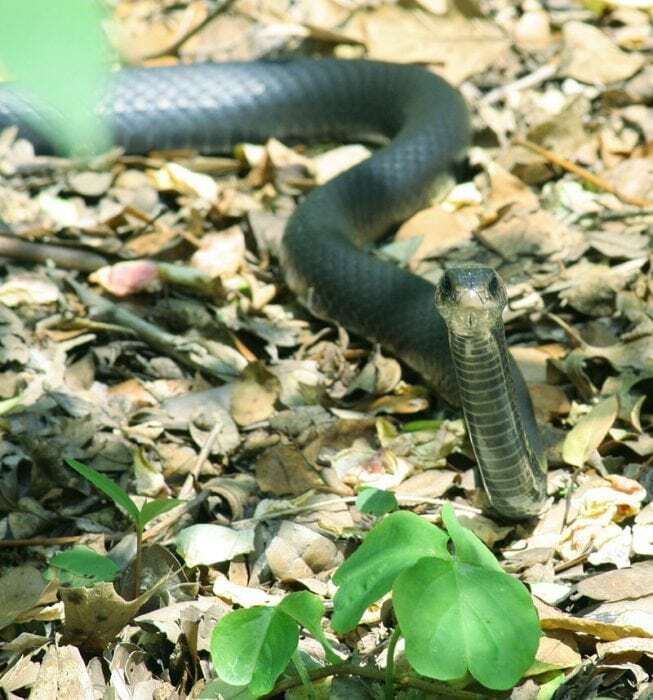 The southern black racer typically ranges between 0.6 to 1.4 meters in length or between 20 to 55 inches in length. The name of the southern black racer implies that they are quite fast, and this is largely true. They have fairly high speed and mobility over the ground, which is enough to enable their escape from most threats. They are believed to have a top speed of around 6.5 km/h, or 4 miles per hour. Which is approximately the speed of a human quickly walking or slightly jogging. This speed gives them the ability to flee towards nearby trees, tall grass, or bushes, where they can hide. They are also adept at climbing and swimming. The snake’s smooth scales and skin help give them the speed they need, and the snake tends to shed its skin once a year. The snake prefers flight over the possibility of a fight, yet if the snake is cornered it is known to lash out and repeatedly bite. Black racers prefer thick regions of brush, overgrown wooded areas, and thickets as their habitat. However, they can be discovered in more open regions. The snake simply looks for places where there is both covered and exposed ground, as it must move in and out of sunlight to regulate its body temperature, much like all cold-blooded species. The southern black racer is less timid than some other snakes, and for this reason they are often found in the yards of suburban homes. Unlike some other snakes, they are more active in the daytime. While not especially dangerous compared to venomous snakes, southern black racers will react aggressively if handled or threatened. The bites of the black racer can be quite painful and could become infected. The black racer will also release a foul-smelling order in an attempt to encourage their release. If the snake believes it is threatened it will typically vibrate its tail in patches of grass in order to mimic the sound a rattlesnake makes. Like all snakes, the southern black racer is carnivorous and it subsists mainly on small mammals and amphibians. The black racer is known for eating rodents, lizards, toads, frogs, and even smaller snakes. It will essentially consume any smaller animal that it can constrict and kill. Despite being given the name constrictor, the snake doesn’t actually constrict prey to kill it the same way that constrictors like the burmese python do. Rather, they kill their prey by crushing it into the ground and suffocating it. The predators of the black racer include birds of prey like the broad-winged hawk and the red shouldered hawk as well as coyotes, cats, and both wild and domestic dogs. Hawks are a particular threat to the black racer, as they can use of their incredible eyesight to spot black racers from a considerable distance and then it use the element of surprise to swoop down and grab the snake. The breeding season of the southern black racer is typically between March and August, and the snakes will lay their eggs around the same time period. Females can lay a clutch of up to approximately 23 eggs. Young, baby snakes are approximately 15 cm or 6 inches in length and are capable of fending for themselves, so the snakes don’t protect their young. Only around 40% of the newly born black racers will survive through their first year of life, and the average amount of snakes that survive out of a batch is about eight. One rumor about the black racer is that it is a beneficial snake to have near homes because it fights off venomous snakes. While black racers do occasionally fight and eat other snakes, there’s no major evidence to support the idea that black racers target venomous snakes in particular. Black racers tend to prefer rodents and frogs or lizards over other snakes, and they in fact sometimes hibernate alongside rattlesnakes and copperheads. Another rumor is that the black racer can mate with venomous snakes to create black snakes that are venomous, though this is likewise not supported by evidence. The black racer is considered endangered by the Association of Fish and Wildlife Agencies. Racers have become limited to the southern part of Maine and may lose their habitat entirely if their habitat continues to be encroached on by human activity. The snakes are often accidentally killed by cars or killed intentionally by humans out of fear. 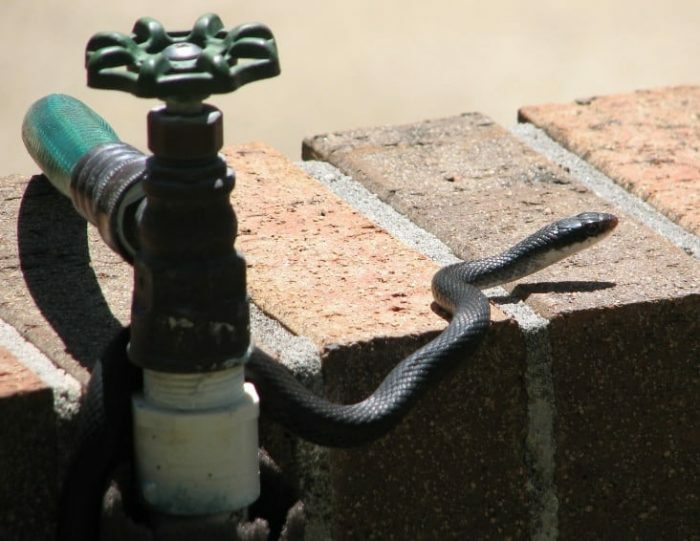 The best course of action when seeing a black racer is to simply leave it alone, though if you are concerned about the presence of the snake, a nonlethal trap can be used to contain the snake and move it elsewhere. A professional snake removal service can also be contacted.